Hey & happy Friday everyone! I'm super thrilled share my Gypsy Den adventure with you. I was invited to taste some of their excellent vegetarian foods while I was visiting Santa Ana, CA. I am always on the lookout for vegetarian & vegan-friendly dining because I dislike heading out to eat only to find one measly option. Lucky for me, Gypsy Den had several dishes to pick from. 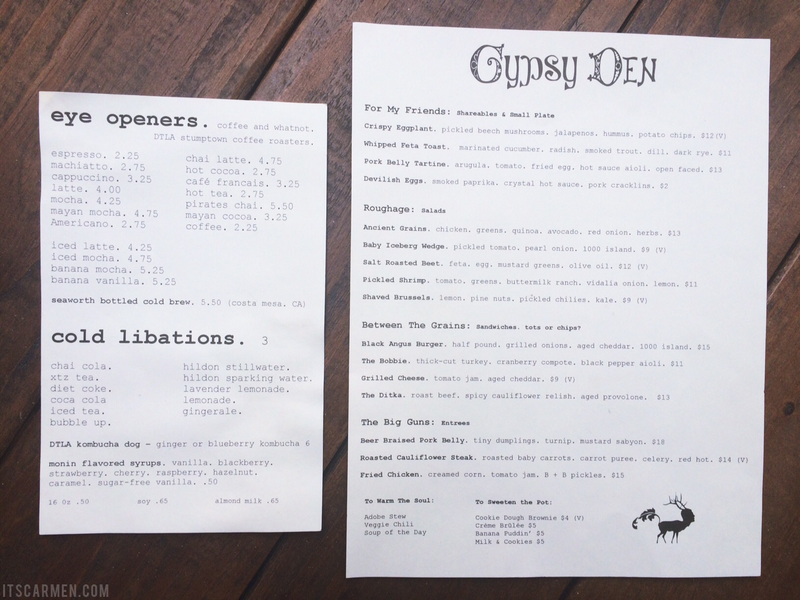 Gypsy Den is an alternative coffeehouse & eatery located in the heart of downtown Santa Ana; they also have Costa Mesa & Anaheim locations to choose from. While I was visiting the Gypsy Den, I met with Brittney, the district manager, & Kris, the chef. Brittney told me they were in the midst of rebranding the stores & revamping the menus. Both Kris & Brittney are quite new to the Gypsy Den family but clearly knew their stuff. 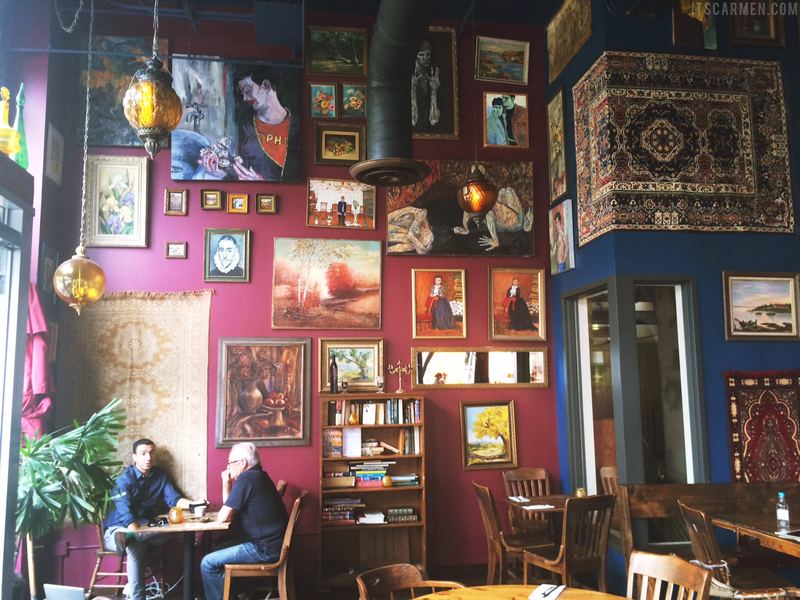 I walked in & saw a vast space filled with an eclectic & eye-catching array of art. The ceilings were high & the walls were painted a bold maroon hue. You could spend hours staring at the walls as if it were a museum full of paintings, pictures, & prints. 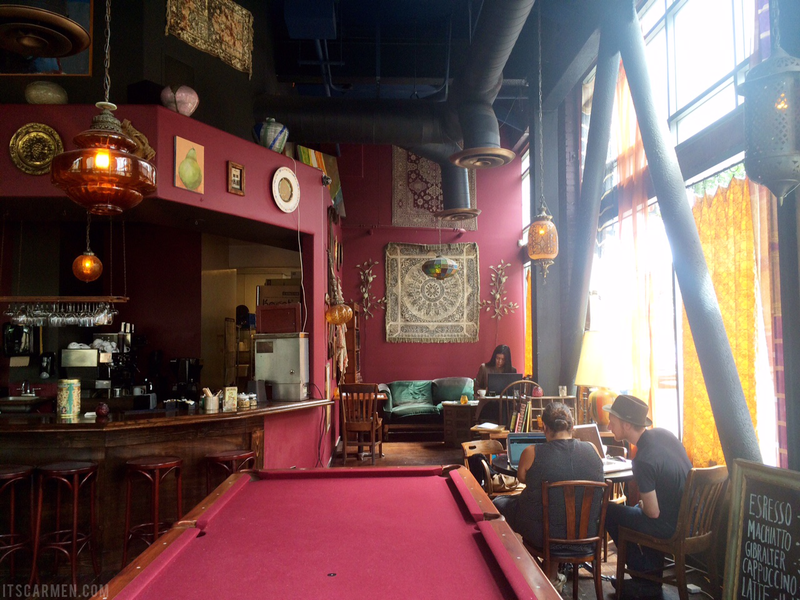 The ambiance is such that you can bring your laptop & get to work, slowing sipping on coffee. We had the option to sit inside or outside, & given that it was a delightful Southern California day, I chose outside. Brittney recommended Taylor's Tonics Chai Cola, a soda with black tea, ginger root, & cinnamon bark. Consider it pure heaven, a blissful mixture of chai tea & cola. She also suggested the XTZ Tea, which she described as the original Red Bull. These drinks are $3 a piece. XTZ Tea contains caffeine & herbs such as ginseng, guarana, maté, botanical herbal black & green tea extracts, & more. 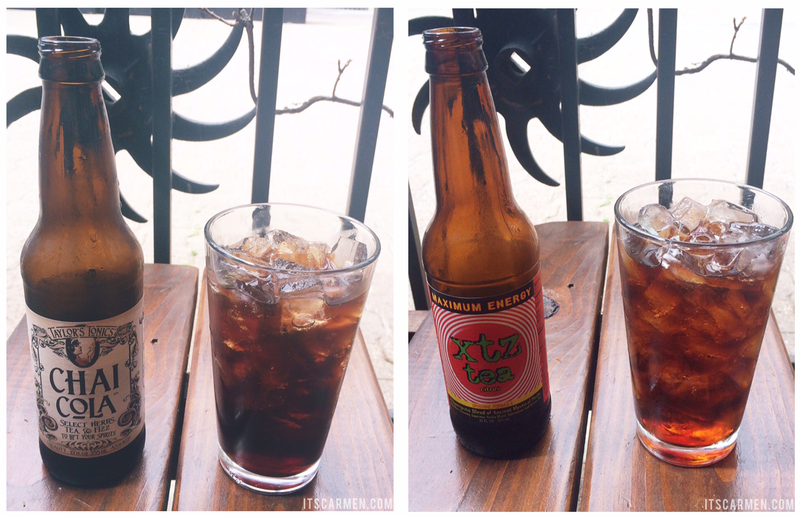 I preferred the Chai Cola & my boyfriend, Fred, said "the XTZ tea was better than any energy drink I've ever tried." I'm not the biggest fan of energy drinks so Chai Cola was a clear winner. 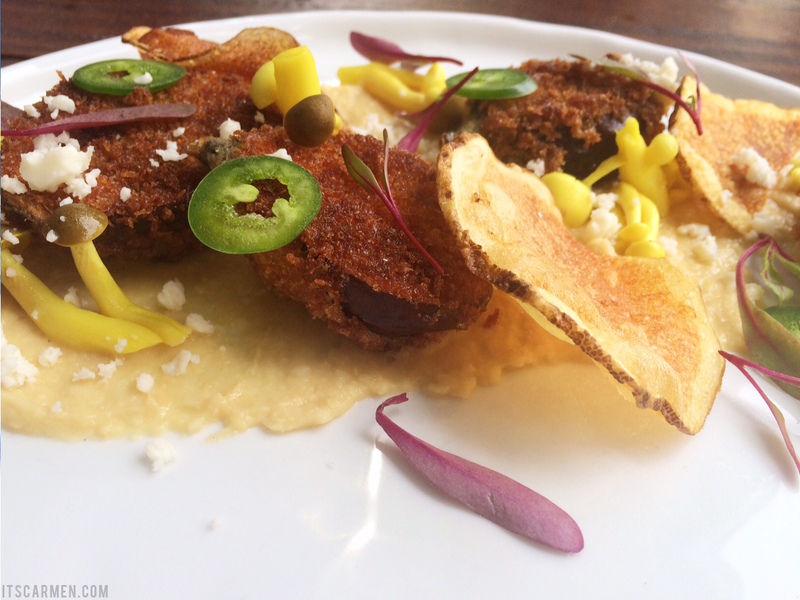 First up on the taste test menu was the Crispy Eggplant with pickled beech mushrooms, jalapenos, hummus, & potato chips. The lemony hummus & pickled mushrooms supplied a tart kick, while the crunch from the eggplant & potato chips gave you just the right amount of texture. This dish had immense flavor & dimension. Crispy Eggplant will cost you $12. 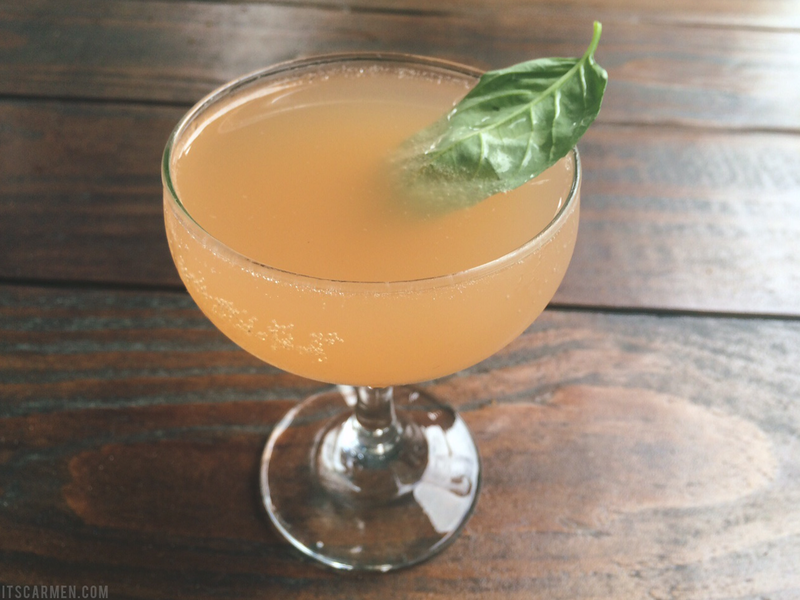 After the first appetizer, Brittney brought out Ruby Slipper #2 which is a cocktail of grapefruit, basil leaf, & brut. The Slipper is refreshing, zesty, & goes down easy. The portion is small but satisfactory with the right amount of sweetness. This cocktail is $7. 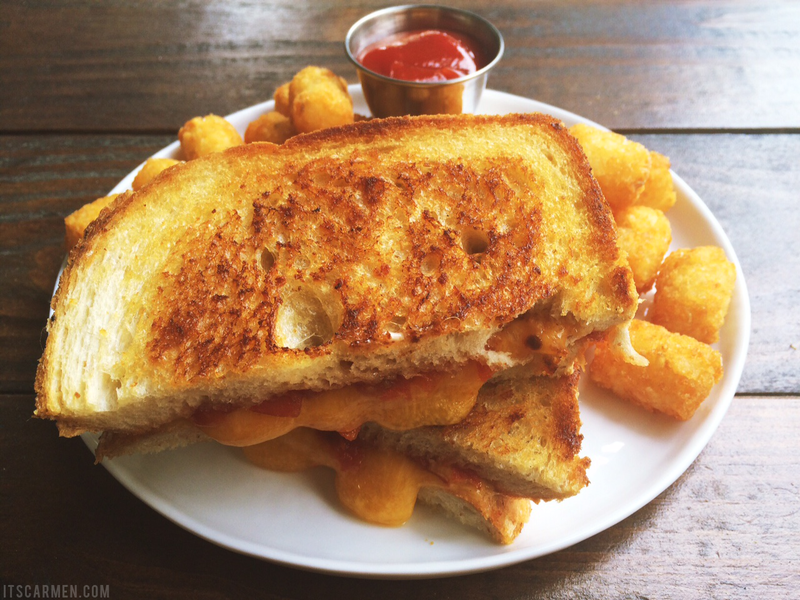 Next, we noshed on the Grilled Cheese with tomato jam & aged cheddar with a side of potato tots. The tots were crispy & plump. I am not a fan of tomato whatsoever, but the kick of the tomato jam left me wanting more. It's as good as it can ever get. Side note: we didn't finish the grilled cheese & tots, so I ended up munching on them later that evening in the hotel room. Score! Grilled Cheese runs for $9. 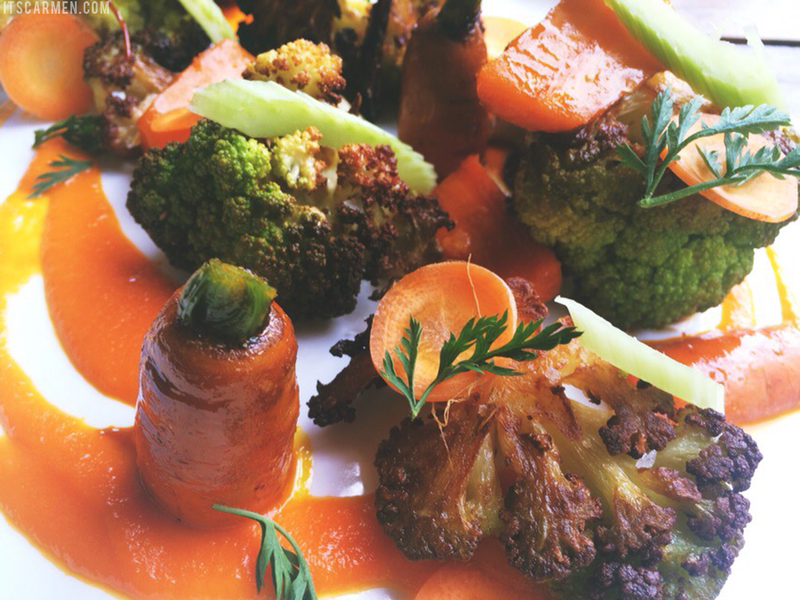 Lastly, we ate the Roasted Cauliflower Steak with roasted baby carrots, carrot puree, celery, & red hot sauce. I was the most impressed with this dish, as it included an innocent variety of ingredients that turned into a feisty & delicious meal. I enjoyed the slight charring on the cauliflower, the sweetness of the carrot & carrot puree, & the bite from the celery. This dish is $14 & well worth it. Fred & I both deemed the Roasted Cauliflower Steak our favorites. I wish I had enough room in my crowded stomach to try a dessert for you guys, but alas I'd already eaten too much. I'll save that for next time. 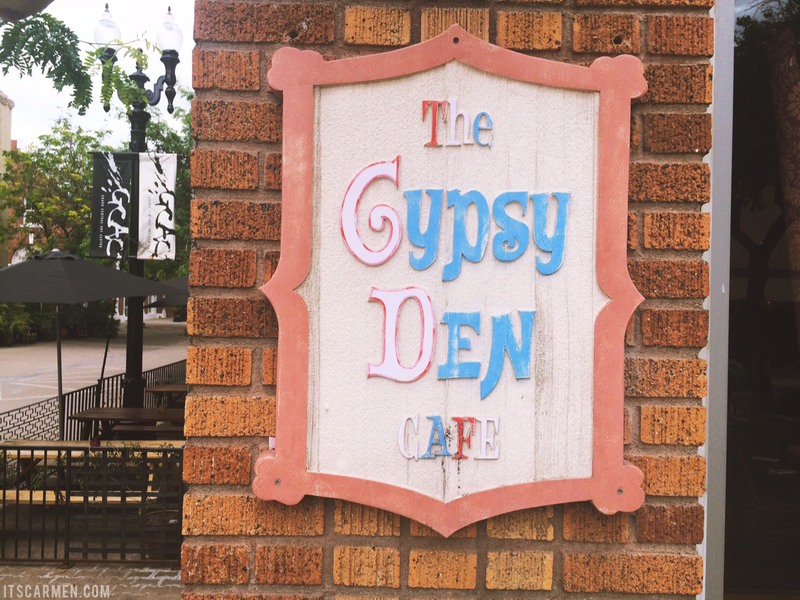 Gypsy Den is unlike your regular cafe where items seem bland & sit out for hours at a time. Chef Kris brings personality to each dish & he plates them beautifully. You are getting quality, gourmet food for the price you pay. It look cool and delicious! I would love to visit this place! Wow, the interior is so homey and artsy, I love it! I'm vegetarian so I'm ACHING to try this place out; there aren't many vegetarian restaurants where I'm from so I always have to end up ordering salads at non-vegetarian places, and though I love them, it can get pretty boring sometimes. The Roasted Cauliflower Steak looks AMAZING. 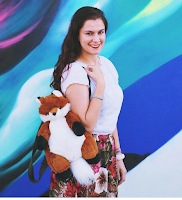 If you're going back for dessert, do write a post! I'd love to read about Gypsy Den more! Just an amazing place, I would like to be there!! Oh my gosh the food looks AMAZING!! yuM! What a nice little place! I always see places like this when I'm traveling, and I want to take a million pictures, but I don't want to be a tourist. Such a struggle. Great photography! Looks like such a lovely place. Yuuum. The roasted cauliflower steak looks sooo scrumptious! I have never been to Santa Ana, but if I ever go, at least there's one place I'll know has good food, haha. 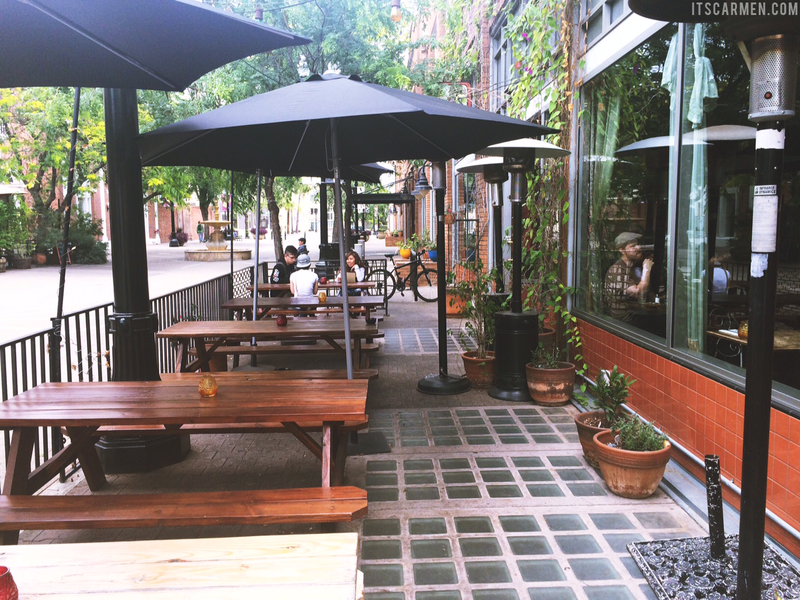 We love our Gypsy Den and we love our Downtown Santa Ana! Thank you for this! Woah! This Café looks so nice! Hi lovely, this place look amazing and the food look so good! thanks fro sharing. I love the Gypsy Den! I need to go there again soon! Oh my gosh I'm drooling! That meal looks absolutely incredible. Whoa, this place seems amazing! 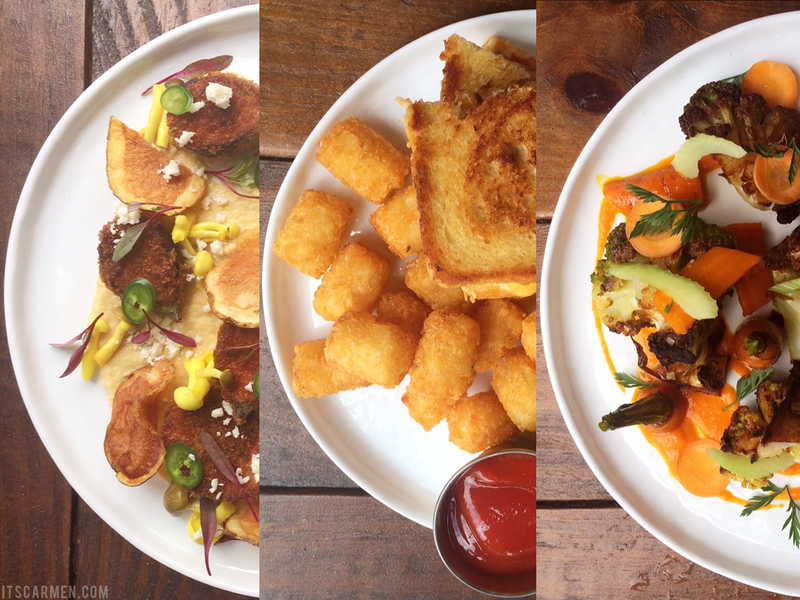 Everything looks totally delicious, but that grilled cheese is especially mouth watering. Nice picks! This cafe seems so fun and the dishes look delicious! Everything looks delicious, would love to try the XTZ tea. Love it.